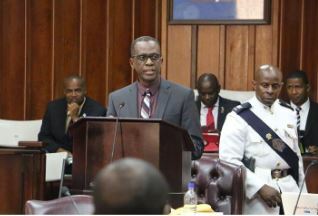 Press Release:– Mr. Speaker the tabling of these estimates must be viewed from its impact on the local populace: have the monies spent in the last fiscal year 2018/2019 improved the lives of most Saint Lucians and are there reasons to believe that the planned expenditure for the 2019/2020 are realistic and likely to improve the living conditions of Saint Lucians? The Social and Economic Review indicates on Page 47 “a higher current account surplus which is expected to increase to $76.7M in 2017/2018 to $97.9M in 2018/2019. 1) The budget summary does not seem to say the same story. The Budget Summary states that current account surplus is $30M and is projected to be $5M in the coming year. Deal with it, Mr. Pierre, give us a fair deal! An excellent presentation Prime Minister Pierre once again you have hit a home run straight out of the park. Paragraph 2 brought a tear to my eyes once again you have shown true leadership that you are not of the belief that St Lucia should be run as a business like “they” are doing but rather that St Lucia and St Lucians should get due diligence for every cent and not just about selling out. You are on to of your game question them about every cent every contract St Lucians will never be tired to hearing where there monies are going to and those who are benefiting from their Cronyism and Nepotism with non transparency is the norm of the day that’s there motto. My only concern is you left out the fact that 5 million and change US is due on that 100 million Mr borrower borrower & beggy beggy took out come this May and that’s on the interest only we are 5 years away from even to begin paying on the principal balance may God help us. Keep at them soldier may God give you the wisdom and strength and courage to deal with them every day.